What an honor it was to witness, for the first time, Penacook’s Annual Fire Fighters, Emergency Services and Law Enforcement Parade yesterday, Sunday June 2nd, 2013. It was a hot morning, where I was almost home from my morning walk, when I approached a section of Village St., lined with cars and people standing about with others waiting within Woodlawn Cemetery. As I met up with a friend, who had also stopped from her walk, we could see the lights of a Fire Engine leading the parade. Without hesitation, we decided to participate in the viewing of the small parade and accept the invitation to follow the marching participants into the cemetery towards the new memorial. This parade and ceremony was started approximately 100 years ago, as a tribute to the Fire, Police and EMT’s. 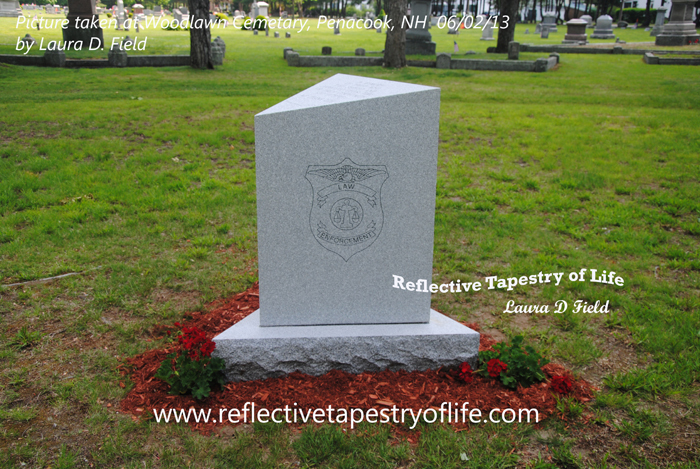 It honors the fallen as well as those who currently serve. It was an honor to be present for this ceremony. The Merrimack Valley High School Band did an excellent job, presenting their talents in a professional manor. Today’s uniform for the hot weather has changed since my marching days in the late 70’s, where I grew up in Southwick, MA. The temperature was in the 90’s, and the heavy marching uniform of years past, would have been quite uncomfortable for the students. I was impressed with the teamwork of marching together and playing well in honor of those who have served and are currently serving now. Others who marched included those who serve in our Sheriff departments, law enforcement, as well as the Fire Departments. There was an obvious pride of many who marched and then stood at attention as the ceremonial speakers spoke. What made today’s ceremony extra special was the monument that was presented by a MVHS Senior, Cameron Bailey, who worked and designed an EMS Memorial for his senior project. His purpose in providing the cemetery a memorial was first driven by his own observation that at the annual parade, flags were placed in the ground then later picked up, leaving no honoring symbol that those who had passed were remembered. In providing this memorial, after all the flags are removed, there now remains a memorial in honor of all those who have served and fallen in their service to our community. This was a very humbling service for me, for two reasons. The first reason was seeing a young man who’s heart was driven to raise funds and design a memorial that would commemorate three community services honoring those who died to protect our community. As he was asked to speak, although he was proud of his work, his words shared his pride through a humble spirit. The second reason was that two summers back, our family was in need of the Fire Departments service, as our small barn quickly went up in smoke. We stored seasonal items along with many years of memories in this out building. I will never forget watching them work or the compassion they shared towards our family. They later returned to our home, in the dark of the night, to be sure that there were no remaining burning embers. I believe that God placed angels that day around the fire as the men worked, for the next day, the closely grown trees were scorched yet not harmed. In addition, the fire was contained, where no other property in the neighborhood was damage and no one was hurt. The crowd could have been larger at yesterday’s parade, yet with church services and ball games, etc., those that were in attendance were honored to be present as they witnessed a simple yet memorable ceremony. As I returned home, to share why I was late from my walk to my husband, I could hear the MVHS band, continue to play as they returned to the high school. What the students do not realize, is that not only yesterday, but every day they practice and I am at home, I have the pleasure of listening to them, as the music and the marching drums bring back many fond memories of my marching years. 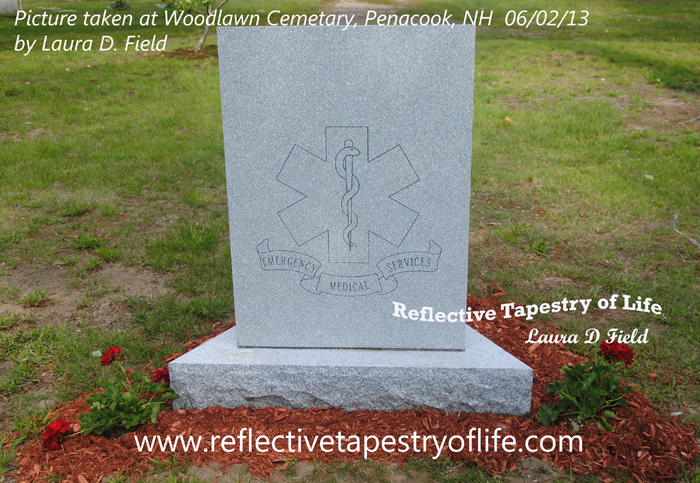 If you are passing through Penacook, take a moment to stop at Woodlawn Cemetery on Village Street. The Monument is on the north entrance. 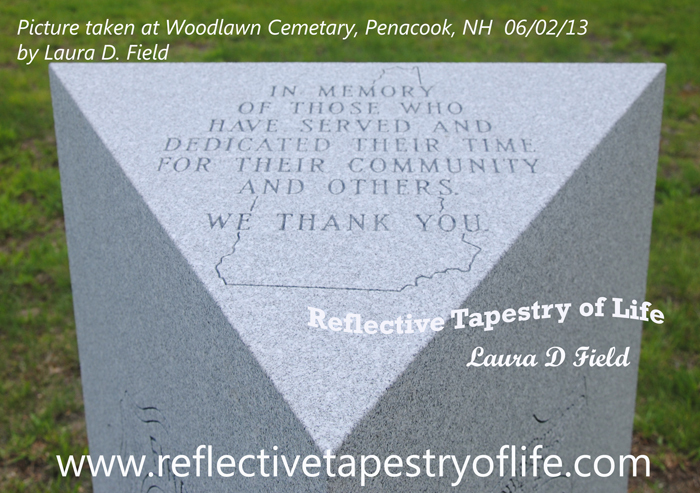 As you walk in about 200 feet, you will encounter a 3-D, equilateral triangular monument, with the top depicting the outline of the state of NH, with a quote sharing “ In memory of those who have served and dedicated their time for their community and others. We thank you.“ Each side has a shield representing each service honoring the fallen: The Fire Department, Law Enforcement and the EMS. With respect, I share my deepest thanks and appreciation, to all who serve our communities. 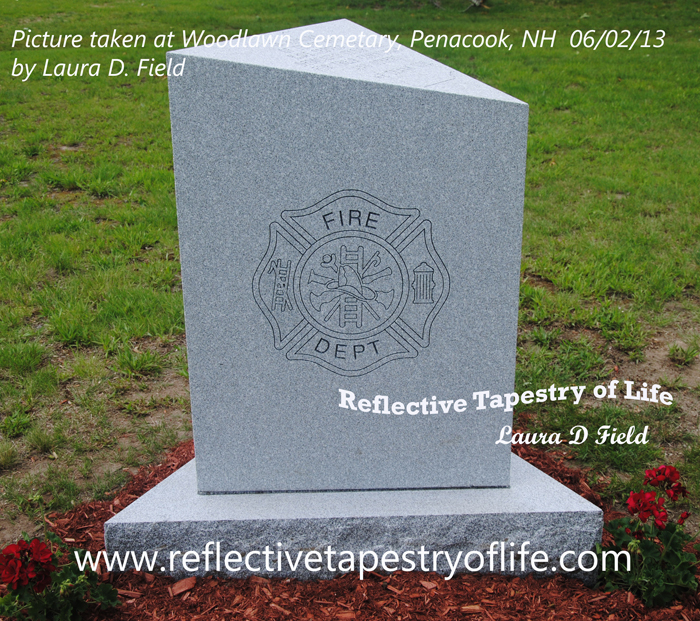 This entry was posted in Hope, Life, Memories, Positive Thoughts, Today's Thoughts and tagged Ceremonial, ceremony, EMS, Fire, honor, Memorial, parade, Police, Sheriff. Bookmark the permalink.